Chromium is a lightweight blue-silvery white metal. The name chromium comes from the Greek "chroma" and means color. Thanks to its very high corrosion resistance against many different acids and bases as well as hot gases, chromium is a popular material for all types of protective coating. In combustion equipment, chromium is used as a wear-resistant coating to increase the service life of specific components. As a component in high-temperature fuel cells, our chromium also performs brilliantly. Alongside these applications, our chromium is also used as a brilliant decorative coating for operating elements on appliances or for jewellery. You can rely on our quality. We produce our chromium products ourselves – from the metal powder right through to the finished product. As our input material, we use only the purest chromium powder. This ensures that you benefit from a very high level of material purity. Excellent wear resistance. Beautiful optics. As a chromium nitride hard material coating applied to moving parts, the material provides reliable protection against wear and abrasion. In addition, chromium gives brilliance and sheen to watches and fittings of all types. At the same time, chromium protects against corrosion. Pure chromium - or maybe an alloy? And there's more: By using our own customized manufacturing processes, we can modulate various other properties of chromium and chromium alloys across a wide range of values. CFY is a chromium-based alloy with a 5 % iron content. The material is primarily used for interconnects in fuel cells. The coefficient of expansion of CFY is precisely adapted to that of the electrolyte in the fuel cell. 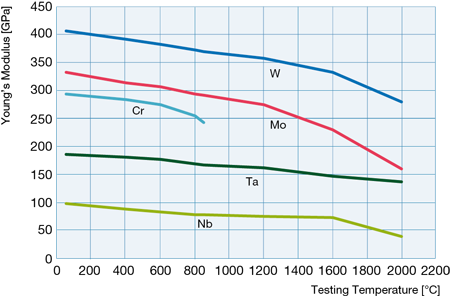 The table below presents the thermal expansion curve of our CFY alloy. At temperatures of use of up to 850 °C, the corrosion resistance of the chosen material is a crucial factor. In particular, the CFY interconnect must withstand aerial oxygen and a high hydrogen concentration. At high operating temperatures, materials are also exposed to enormous mechanical stresses. Our CFY alloy possesses good stability at high temperatures and good creep resistance. As a result, our material remains stable and resists deformation at all times. Our ITM is an iron-based alloy with a chromium content of 26 % and a tiny amount of yttrium oxide. This alloy is used for interconnects and as a support for the electrochemically active cells in mobile SOFC fuel cells (Solid Oxide Fuel Cell, SOFC). Although the same alloy is used for both applications, its properties differ dramatically depending on the required use. As an interconnect, the ITM alloy is sintered to be completely gastight and is then subsequently rolled. It functions as both a support and a contact in fuel cells. The interconnects must be corrosion resistant and dimensionally stable at temperatures up to 800 °C. This is possible thanks to the use of yttrium oxide as a dopant. The ITM support element in electrochemically active cells has replaced the conventional ceramic carriers used in mobile fuel cells. For this application, we sinter the ITM alloy in a way that makes it particularly porous. Only in this way can we achieve the optimum gas permeability required by the fuel cell. The ITM support is better able than ceramic solutions to withstand the stresses induced by temperature fluctuations during start-stop cycles. ITM also exhibits better mechanical stability in response to vibration and movement than ceramic materials. Our ITM alloy can also be used as a component in steam reformers for hydrogen production. The demand for hydrogen and the desire to be independent of industrial producers are constantly growing. Our ITM alloy is used as a tubular membrane in small systems for independent hydrogen production. For this application, we sinter our ITM to be porous and permit the optimum diffusion of hydrogen. We coat the ITM tubular membrane with palladium. Although the material is permeable to hydrogen, it prevents the diffusion of unwanted gases. Hydrogen of a purity > 99.9 % can be produced economically and efficiently. At operating temperatures of over 500 °C, the rod-shaped membrane must retain its shape. It must not oxidize. Our ITM alloy, which is stabilized with yttrium oxide, is the ideal material for this. A good all-rounder. Material properties of chromium. Chromium belongs to the group of refractory metals. Although its melting point of 1 900 °C is higher than that of platinum (1 772 °C), it is at the lower end of the range for refractory metals. In most cases, the high melting point of refractory metals is coupled with a low vapour pressure. This is not the case with chromium. The metal has a very high vapor pressure.The density of chromium is also similar to that of iron and niobium and lies below the 10 g/cm3 of molybdenum or tungsten. 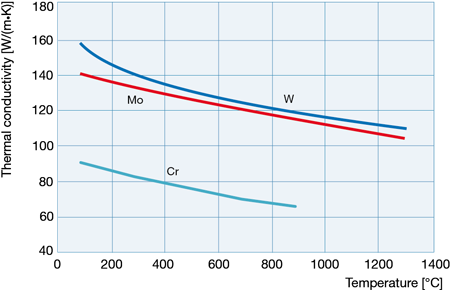 Chromium's modulus of elasticity is also lower than that of molybdenum and tungsten. Most refractory metals have a low coefficient of linear thermal expansion and a high level of thermal conductivity. However, chromium does not have the same typical behavior as molybdenum or tungsten. The coefficient of thermal expansion is relatively high. Above a temperature of 37 °C, the material's behavior changes from antiferromagnetic to paramagnetic. From this temperature up to the melting point of the material, the coefficient of thermal expansion increases very sharply. This transition temperature (Néel temperature) is a first order phase transition and corresponds to a massive increase in the volume of chromium which greatly influences the coefficient of thermal expansion and therefore means that the curve is not linear. Solids can exhibit five different types of magnetic behavior depending on their atomic structure. Two of them, paramagnetism or antiferromagnetism, are exhibited by chromium depending on the temperature. In the case of paramagnetism, the individual magnetic moments are aligned with and strengthen the external magnetic field. When the external magnetic field is removed, the internal magnetic field collapses again. In the case of antiferromagnetism, the individual magnetic moments are in antiparallel alignment with the external magnetic field and there is therefore no measurable magnetic behavior at the macroscopic level. 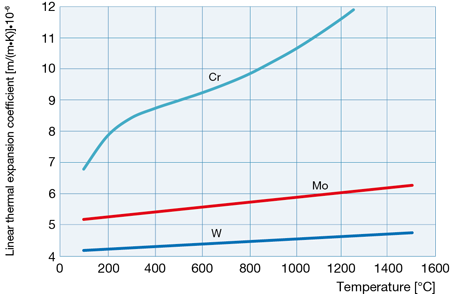 Even though the thermal conductivity of chromium is lower than that of tungsten and molybdenum, the curve follows exactly the same trend: the thermal conductivity falls as the temperature rises. Close to the Néel temperature, the thermal conductivity is also influenced by the phase transition although not to the same extent as the coefficient of thermal expansion. Some of the thermophysical properties of chromium are greatly affected by temperature. The diagrams below depict the curves for the coefficient of thermal expansion and thermal conductivity. As a body-centered cubic metal, chromium, like molybdenum and tungsten, has a transition temperature from brittle to ductile. In the case of chromium, this temperature range can extend from -50 °C to 350 °C. The most important factor influencing this transition temperature from brittle to ductile is the purity of the chromium and, in particular, its nitrogen and oxygen content. However, the presence of other alloy elements, the microstructure and degree of cold working also have a significant impact on the transition temperature. Fully recrystallized chromium exhibits absolutely no ductility at room temperature. However, if the chromium is formed or soft-annealed then the material becomes ductile. The addition of iron as an alloy element also increases the ductility of chromium. Chromium becomes stronger with increasing cold working and this strength can be further increased through the addition of various alloy elements. To ensure a high level of thermal stability and creep resistance, we alloy our chromium with yttrium oxide. This prepares the material for use at temperatures of up to 850 °C. In contrast to the other refractory metals - molybdenum and tungsten - chromium has a relatively low melting point of 1 907 °C. Its modulus of elasticity is also relatively low. However, chromium has a much higher modulus of elasticity than either tantalum or niobium - both of which have higher melting points than chromium. Most people are familiar with chromium as an alloy element in stainless steels and as a protective coating in various applications. In contact with any corrosive medium such as oxygen, chromium forms a transparent passive layer (Cr2O3). This passive layer is absolutely stable in normal atmospheres and in aqueous solutions. As a result, chromium is very frequently used as a decorative, and simultaneously corrosion-resistant, coating. This same passive layer also protects stainless steels against corrosion. Cr2O3 also reliably protects chromium against aggressive acids such as sufuric or nitric acid. In combustion equipment such as gas turbines or diesel engines, chromium excels due to its exceptional resistance against hot gases. Temperatures of up to 1 000 °C pose no problems to chromium. In terms of stability, it can hold its own with the best materials available on the market. The table indicates the corrosion resistance of chromium. Unless indicated to the contrary, the specifications relate to pure solutions not mixed with oxygen. Tiny concentrations of extraneous chemically active substances can significantly affect the corrosion resistance. Do you have any questions regarding corrosion-related topics? We would be delighted to help you with our experience and our in-house corrosion laboratory. In 1766, Johann Gottlob Lehmann discovered a brownish-red lead ore (PbCrO4) which is now known as crocoite. At that time, chromium was still unknown and was not recognized as being a component of this red ore. It was not until 1797 that Louis Nicolas Vauquelin guessed that this brownish red lead ore had to contain a hitherto unknown element. Using potassium carbonate and hydrochloric acid, he succeeded in obtaining chromium oxide from the ore which he later reduced in a graphite oven to produce a light gray metal. The name chromium comes from the Greek "chroma", meaning color, and was given to the element due to the many different colors of chromium oxide. One of the most fashionable of the colors that come from chromium oxide is chromium yellow, the color of school buses in America. There are several different ways of preparing chromium ore. The level to which the chromite (FeO.Cr2O3) is contaminated by other ores such as Mg silicates and the proportions of Cr2O3 and FeO are crucial in determining the complexity of the process. The chromium oxide content of the concentrate must be at least 50 % if it is to be used to produce metallic chromium. When exceptionally pure chromium is required, the electrolytic process is used. Using this process, purities of up to 99.995 % are possible. This is achieved by dissolving CrO3 Cr(VI) in sulfuric acid and using a galvanic deposition process to obtain chromium flakes. However, because this process comes at a significant environmental cost, it is not used in all countries. How do we do it? Powder metallurgy! So what is powder metallurgy? It is well known that nowadays most industrial metals and alloys, such as steels, aluminium and copper, are produced by melting and casting in a mould. In contrast, powder metallurgy does away with the melting operation and the products are manufactured by compacting metal powders which are then subjected to a heat treatment (sintering) below the melting temperature of the material. The three most important factors in the field of powder metallurgy are the metal powder itself as well as the compacting and sintering operations. We are able to control and optimize these factors in-house. Why do we use powder metallurgy? Powder metallurgy allows us to produce materials with melting points of 2 000 °C or higher. The procedure is particularly economical even when only small quantities are produced. In addition, by using tailor-made powder mixes, we can produce a range of extremely homogeneous materials endowed with specific properties. The chromium powder is mixed with alloy elements and then filled into moulds. It is then pressed at extremely high pressures. The resulting pressed part (also known as a "green compact") is then sintered in special high-temperature furnaces. During this process, the green compact acquires its density and its microstructure forms. The very special properties of our materials - such as their excellent thermal stability, their hardness or their flow characteristics - are due to the use of the appropriate forming methods, for example forging, rolling or drawing. Only when all these steps dovetail perfectly can we achieve our exacting quality demands and manufacture products of outstanding purity and quality.